Rumi Goa is the newest performance arts place to come out of Taleigao. 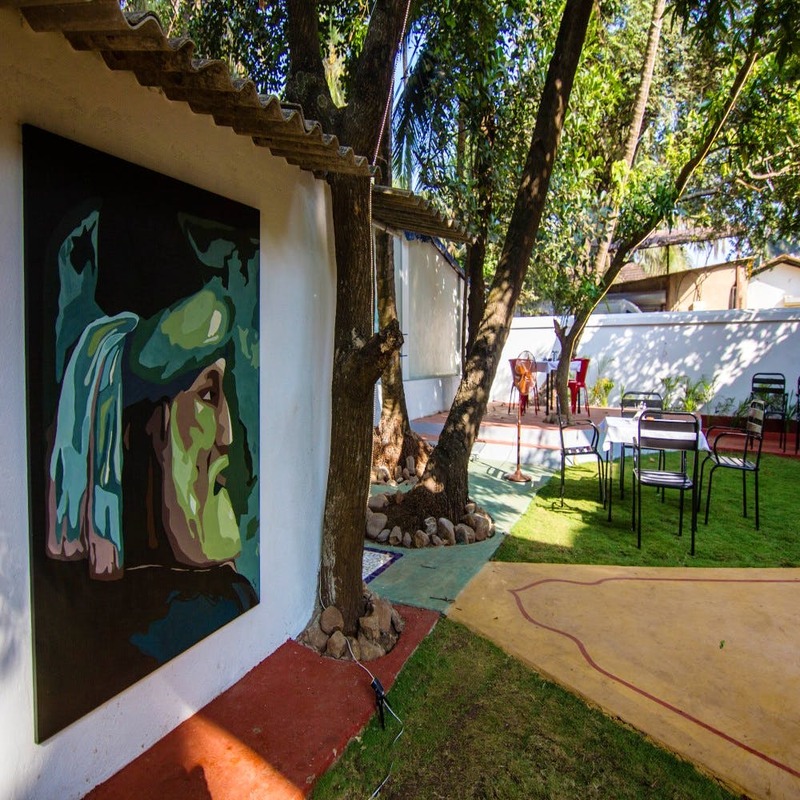 Set in an old Goan house with a massive lawn, the place is a cafe-meets-arts-space. They do homely lunch and dinner thalis through the week but dedicate a few evenings a month to poetry, theatre, music and dwelling on Rumi, the celebrated sufi poet’s works. Ryan and his best friend (and now business partner) Nassim were roommates in Bengaluru and Nassim dreamt of opening a restaurant for eight long years. Ryan, on the other hand, was the guy who likes businesses. Apart from their individual dreams, they also felt a strange power in Rumi’s wise words and knew this feeling had to be shared and celebrated. All of these factors led to Rumi Goa; a space that’s been quietly doing what it set out to do. They were hosting their second gig and we paid all of INR 200 for a cover charge. As the evening progressed, we were surprised to see so many people pour in. From curious neighbours to party loving folks, to chill college goers to families with doggies, everyone managed to squeeze themselves into chairs and on to mattresses. Barley & The Herbs brought their reggae mixed with rock music to the yard and at some point past 11pm, we even heard a crazy rendition of our favourite Delhi Belly song. In all, we spent the evening having sangria, eating potato wedges and mutton ghee roast and hanging out with a 100 odd music-lovers like us. Now if you aren’t excited by gigs, know that Rumi isn’t doing just musical evenings. It is in fact largely a place for self exploration and creative expression. To tie in with this idea, they intend to host live gigs twice a month and a poetry session once. The poetry gatherings we’re told, will go beyond readings. Their motive will be to get you thinking, talking and examining. Hey, we forgot to mention Nassim’s bringing his mother’s best recipes to the cafe. So afternoon thalis (available at INR 70 onwards) consist of rice, dal, chicken/mutton/beef curry, subzi and chutney. You can also pick elements that go in your thali and make your own. Their dinner menu’s a little different and we hear their momos and keema pao fly off the shelves. This might be a good cafe to hangout if you work/stay near Panjim or Taleigao. Would have loved for these gigs and poetry sessions to happen more frequently, perhaps. The Rumi folks also cater for parties so holler at them if you have something on the cards. Oh, and they’re closed on Wednesdays and Sundays for lunch and shut for dinner only on Wednesdays.